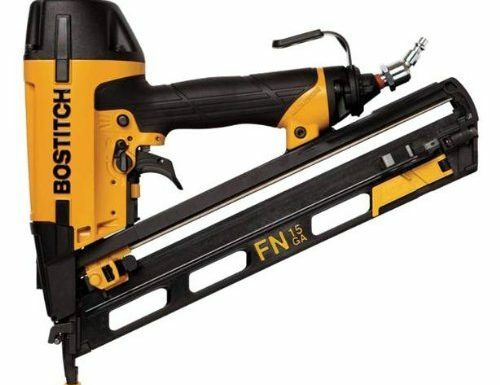 As the nailing tasks are getting more and more complex these days and the demand for the right finish nailer that meets the expectations for different nailing scenarios is always there – BOSTITCH N62FNK-2 has entered the arena with its angled design, balanced weight and enormous power to tackle all kinds of nailing jobs. It can hold as much as 130 nails in its magazine and comes with a wide range of power adjustments between (70 to 120 Psi) to ensure that you are driving the nails in the hard surface with appropriate power. The angled design allows you to reach those areas for nailing that simple nailer cannot ensure a solid finishing. BOSTITCH N62FNK-2 finish nailer is pneumatically powered which means that it is an air powered nail gun and you will need an air compressor and a hose to make it ready for the work. However, it is designed very well and the hose never comes in the way during nailing. Moreover, it is not one of those nailers that require regular maintenance to stay in the rhythm. You don’t have to oil it as it doesn’t require oiling and inner cleaning due to its special design. The body is made of magnesium which makes it light in weight as well as adds durability and strength to it. You can easily carry it with you and complete your nailing jobs with 15 gauge nails. Whether you are making tables, chairs or wooden windows you can rely on the BOSTITCH N62FNK-2 nailer for immaculate finishing. The product comes with a 400 in/lbs power that is quite enough for any common nailing task. The design and built of this nailer makes it a long lasting tool and you can use it for many years without any problem. It has some amazing features that make it stand tall among other nailers. It comes with rubber tips that allow the user to aim accordingly and drive the nails in the right place. The depth adjustment mechanism of this user-friendly and lightweight machine also works very well and lets you drive the nails accurately into the target surface. It’s a fact that while carrying out the nailing tasks sometimes we encounter nail jams however while working with this nailer jamming will not hinder your progress as it comes with an awesome jam clearing mechanism and allows you to keep working without breaks. With its matchless features and balanced design, it can be considered as a lifetime tool. Whether you have to deal with pine, oak wood or any hard surface this nailer always gives a superb finish for all kind of jobs ranging from heavy duty cabinetry, fencing to flooring and ceiling work inside the house.